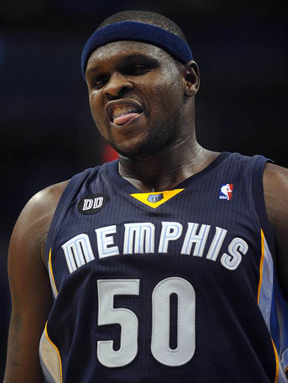 Memphis Grizzlies forward Zach Randolph has been fined $25,000 by the NBA for confronting Oklahoma City's Kendrick Perkins following both their ejections in a game last week. The fine was announced Monday by Stu Jackson, the league’s executive vice president of basketball operations. Randolph and Perkins were each ejected for an altercation with 2:05 remaining in the fourth quarter of Memphis’ 107-97 win in Oklahoma City on November 14. Perkins and Randolph confronted each other between Russell Westbrook’s free throw attempts and were both tossed. The two tried to approach each other while being restrained by teammates before finally heading out tunnels at opposite ends of Chesapeake Energy Arena. Randolph then talked to Perkins near the locker room, drawing the fine.